tends to throw friendly offspring, has great legs, and scurred. 1. Under the Son Senja- Senja is a black sheep, with very nice confirmation and very dense wool. I am hoping Bug can improve the crimp and fineness in her fleece. She is quite friendly. Black lambs likely. 2. Emancipation Inara- Inara is a favorite of mine. She is a Snowflake daughter who always produced lovely lmbs for us. She is a fawn katmoget from our first ever breeding. She is friendly, with lovely fleece and confirmation. Her ram lamb from this year is still for sale. Last year we put her with Bug and the Riddick was a lovely little ram. This year I am hoping for a similiar ewe. Moorit or black lambs likely. 3. Under the Son Sonora- Very friendly ewe that will nibble my fingers if the treats don’t come fast enough. Hoping or an improvement in crimp in white. Black or white lambs likely. 4. Winter Sky Wren- Lovely little moorit yearling with a great fleece. Hoping Bug can fill out her offspring a bit. Moorit lambs. 5. Sheltering Pines Lotus Moon- I kept Lotus’s lamb from last season (Kalinda) and I can only imagine the fleece on her Bug babies will be divine. Stephen has lovely sheep and I can’t wait for these lambs. White or black lambs. White Pine Levi- Levi I had also used heavily in the last few years. He will be for sale after breeding season. 2. Ok Acres Tina- Tina is a great little sheep. She had a great ram lamb with Levi last year so we are putting her with him again to try for a keeper ewe lamb. Moorit or black lambs. 3. Emancipation Cleo- Cleo won 3rd place in a large yearling lamb class at Wisoconsin Sheep and Wool. This will be her first lambing year. Moorit or black lambs. 4. Abbie- Snowflake’s last baby. Katmoget lambs. 2. 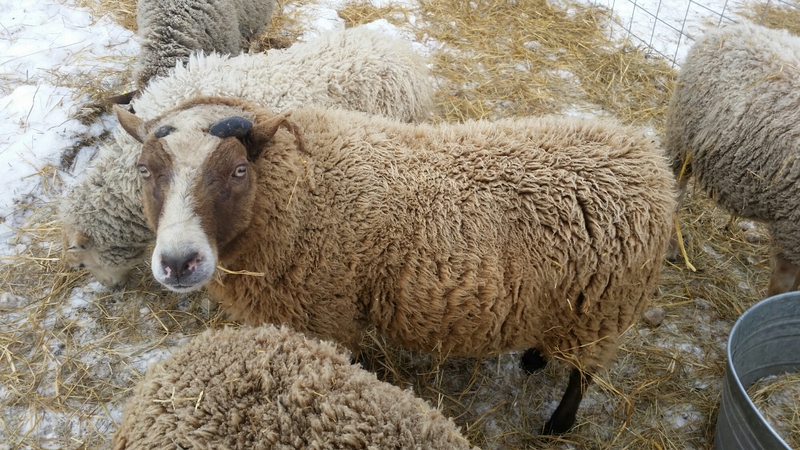 Firth of Fifth Sakadah- mother to Bruce (breeding ram). 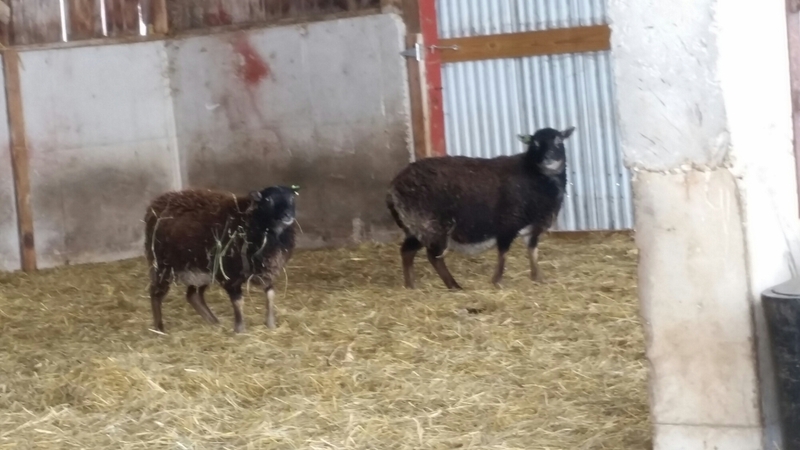 Gul-kat, gulmoget, katmoget, black lambs. Hoping for gul-kats. 4. 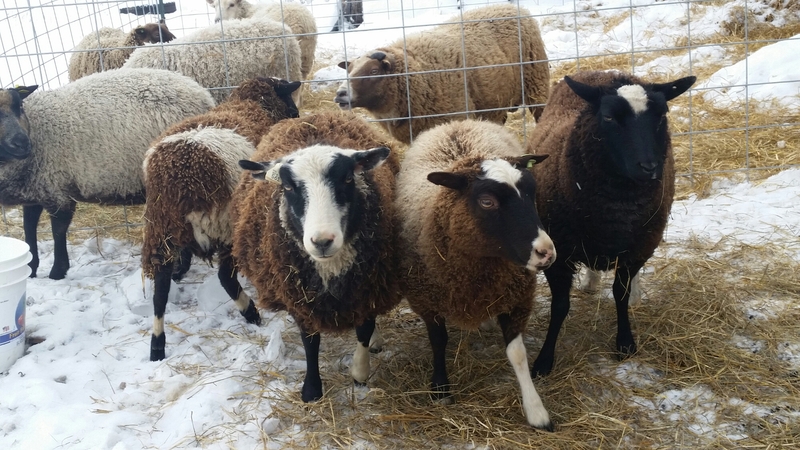 White Pine Faith- Hoping to get a bit more size on the lambs. Katmoget lambs. 2. Sommarang Dawn- My favorite sheep of all time. Dawn throws lovely babies and has a sweet and friendly personality. I’m hoping for gul-kats but could get katmogets, gulmogets or gul-kats. 3. Sheltering Pines Jadore- kept her ewe lamb from last year and sold her ram lamb as a breeding, hoping for moorit gulmogets, but could get gulmogets or blacks as well. Emancipation Augustus- Traded his sister for Winter Sky Wren and kept him. Lovely black spotted ram 2014 ram lamb, with good crimp and nice legs. 1. Little Country Victoria- spotted moorit, hoping for more spots. moorit or black lambs, should be spotted. 2. Little Country Crow- Crow has big, lovely babies, usually singles. 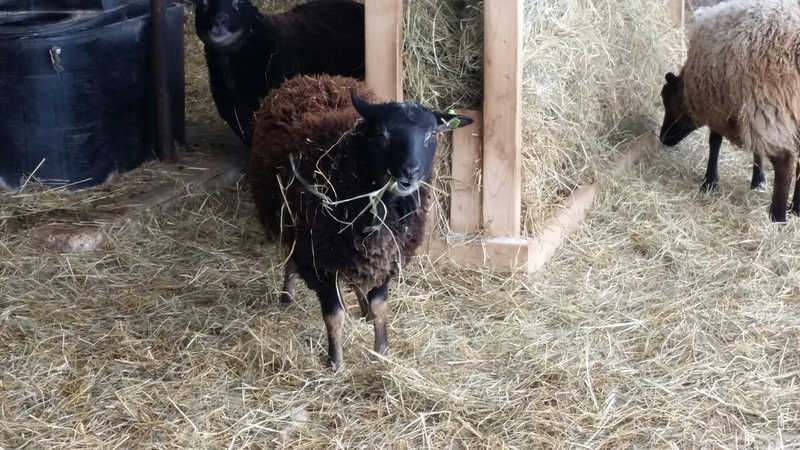 She has had ram lambs two years in a row and I am hoping for a ewe lamb. She is very parasite resistant. Moorit or black spotted lambs. 3. Under the Sun Sula- Black spotted lamb, great density, good confirmation. I am hoping Augustus can make her her lamb’s fleece a bit finer and crimpier. She had a single her first year and this year I am hoping for twins. Lambs black with spots. 4. White Pine Eva- Another Snowflake daughter. Lambs katmoget. 1. Winter Sky Sicily- Hastings is a beefy boy, Sicily is a bit slender and I am hoping HAstings can beef up her frame. Moorit spotted lambs. 2. Emancipation Bethesda- Another smaller framed ewe I am hoping Hastings can beef up. Moorit or black lambs. Spots possible. 3. Little Country Bailey- My second favorite ewe after Dawn. Her daughter got 3rd place in a large yearling ewe class at Wisconsin Sheep and Wool. Bailey carries moorit so moorits or katmoget lambs. 4. Emancipation Ostara- Ostara got 2nd place at Wisconsin Sheep and Wool in the yearling ewe class. She is one of my friendliest sheep and a real sweet heart. Lambs should be katmoget or moorit, possibly with spots. Wow, you are breeding a LOT of sheep – and they all sound wonderful! If I had a big operation, I’d love to take Bug and Levi off your hands….